The Ukrainian pole vaulter Sergey Bubka was virtually unknown before he won the 1983 World Championship at just 19. But in the years that followed, he became the most famous name in the sport, earning six consecutive world titles and breaking the world record for highest pole vault a total of 35 times. That staggering statistic is certainly a testament to Bubka's innate athleticism and unique ability. He vaulted with a heavier pole to generate greater force and, most notably, used his strength to carry the pole from the very end, unlike most of his competition, for better leverage. But the sheer quantity of records he claimed—17 set indoors and 18 outside—was also the result of deliberate decisions and savvy financial planning. Bubka set his first world record a year after winning his first World Championship—besting France's Thierry Vigneron's 5.83m record by two centimeters. But it quickly became clear that Bubka was too good—competitions became rote displays of Bubka's talent and were thus a bit uninteresting because there was no chance for the other athletes to match his prowess. Eventually, sponsors stopped offering the traditional win bonuses that track and field athletes rely on. So Nike started paying Bubka to essentially compete against himself, offering world record bonuses as high as $100,000. He made the smart business decision to spend the next decade breaking records as often and incrementally as possible, at one point setting 14 records over the course of just a couple years. Only once did he lose the world record title—and even then it was a brief concession. 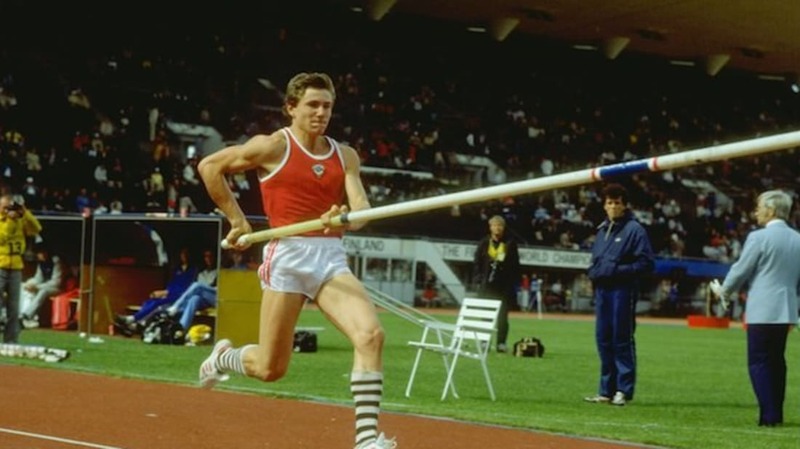 At an August 1984 track meet in Rome, previous record-holder Vigneron passed Bubka's standing record of 5.90m—only to have Bubka regain the record with a 5.94m vault just a few minutes later. Watch a compilation of all Sergey Bubka's outdoor records. After Bubka's inevitable decline in the late '90s, fans were left wondering whether the intentionally incremental strategy kept him from reaching his full potential while at his physical peak. His ultimate record of 6.15m (over 20 feet 2 inches) was long thought unreachable. But had he not been so committed to breaking records a mere centimeter at a time, perhaps he would have aimed higher—literally—while he still could. And, indeed, in 2014, in the same city where Bubka set his final record 21 years before, 27-year-old Frenchmen Renaud Lavillenie set a new record of 6.16m, while Bubka watched from the stands.